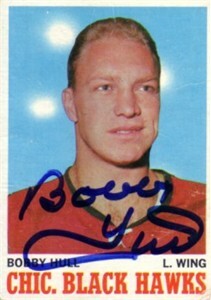 1970-71 Topps card autographed by Chicago Blackhawks Hall of Famer Bobby Hull. Card is in about Good condition (corner wear and surface creases). With certificate of authenticity from AutographsForSale.com. ONLY ONE AVAILABLE FOR SALE.